Who will benefit from the project? On October 18, a business meeting, dedicated to the infrastructure investment opportunities between China and Latvia, was held in Riga. It gathered representatives from the transport industry in Latvia as well as companies from China. The meeting, organized by KPMG, provide an insight into both markets and a platform to discuss potential cooperation opportunities. Rail Baltica Global Project was represented by Kaspars Briškens, the Business Development Manager of RB Rail AS. In his presentation he outlined the importance of a new economic corridor development in Northern Europe emphasizing the role of Rail Baltica in creation of transport connections with the existing European railway networks and Arctic Corridor as well as with the Polar Silk road – a planned grand shipping route connecting China to Europe. 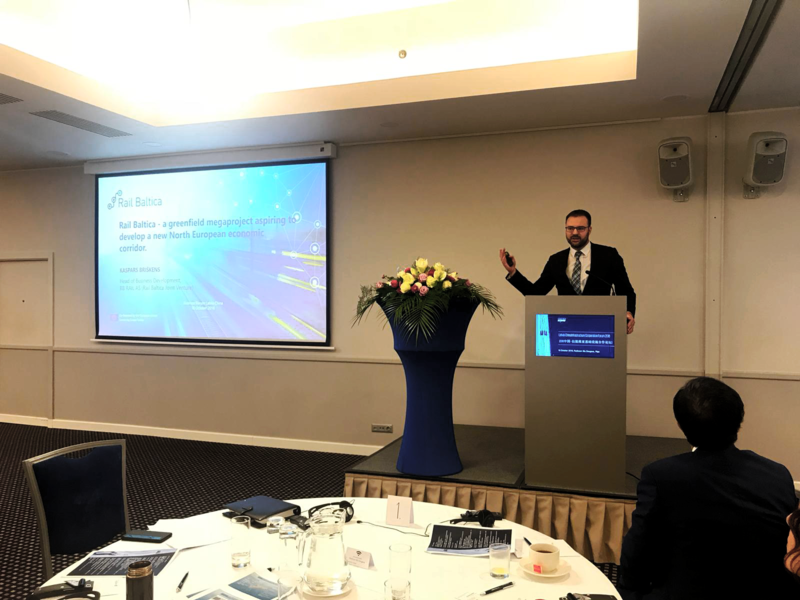 Kaspars Briškens notes: “Rail Baltica team appreciates the high level of interest from the Chinese side regarding the implementation of this Baltic megaproject. As global leader in the high-speed rail development, China serves as an outstanding example of how modern infrastructure transforms its economic geography, promotes sustainable development and ensures unprecedented levels of connectivity”. Subscribe to the Global Newsletter! RB Rail AS, K. Valdemara iela 8-7, Riga, LV-1010. Office phone: +371 66 967 171. Reg. № 40103845025, bank account: LV73NDEA0000084270995, AS "Luminor Bank".